Author Elizabeth Charlotte Grant publishes short/flash literary creative nonfiction explorations and artful scenes from her love story. 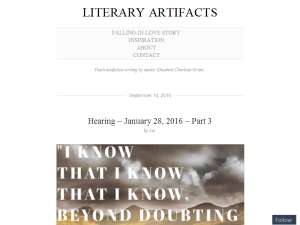 This what your Literary Artifacts Blog Ad will look like to visitors! Of course you will want to use keywords and ad targeting to get the most out of your ad campaign! So purchase an ad space today before there all gone! If you like it, share it with a friend! I’m also taking a break from blogging for a bit so I can get organized for my next season of writing. Expect to see me back at it in October! And just a reminder: these words represent days in February of this past year – which means all of this that I’m documenting are past realities and feelings. I know it’s hard to keep track when you read only once a week! But the place I’m in today (both medically and emotionally) is different from what I’m representing in these blog posts. Thanks for your concerns and prayers in any case! They are not wasted and are very much appreciated. The tearful February day of the appointment plodded mercifully onward, minutes growing to hours. Finally, the sky darkened, and I laid down to sleep. I woke the next morning with swollen eyes, roused by the creeping light, and I rustled out of bed and into the living room, curling into a leather chair, where I wrote down everything I could remember in my journal: how it began, what I could see (and couldn’t), my un-diagnosis. Then dressing, breakfast, and herded to the car, buckling car seats and calming toddlers worried about who snatched batman out of whose hands and whose rightful turn for play it is anyway. I walked my daughter into preschool; then I rode a stationary bike at the gym; then I warmed hot dogs in the microwave for lunch; then I laid my children down for afternoon naps; then I heated frozen dinners for us all; and later, my husband and I watched “The Office” before we again settled beneath the sheets to rest: a normal day. But by the very next day, peace had exited. At dinner, Jeremy and I fought about who to tell about my health and when – I wanted to hide in bed without broadcasting news of my demise to the whole neighborhood, a feeling my husband could not understand. After all, he had already given Joel permission to pass along our news to the church elders, a fact I discovered only after one elder emailed me his condolences. I looked at him and hesitated. “Well,” I said, “Yes and no. It’s that idea of God withholding deserved judgment from us. Like, do people who die in tsunamis deserve it? Yes, because we have all rebelled against God and we all deserve death for our sin. But is there hope through Jesus? Yes.” He thought for a minute, weighing my words, nodding. Then I said, “And of course I can’t help wondering if maybe I did do something, if I’m guilty and deserve whatever this is, or maybe if God’s trying to send me some coded, passive-aggressive message via my stupid bible reading plan…,” I said. “I know, I know it’s ridiculous,” I said. “You aren’t to blame for this,” he said. “I don’t think anything about this could ever be easy,” he said. I nodded, then said, “Maybe you’re right,” and I stood and walked into the kitchen, stepping on the lever that lifted the lid of the trash can and scraping the crumbs off my plate with a fork. They fell into the bag, an unspoken prayer. Dr. Patron left; Jeremy, Zeke, and I filed out of the exam room and down the hallways toward a desk where we scheduled an appointment a month out and handed our credit card over the counter. Then we received the only good news of the day: we owed $314, not $1,000+. Jeremy and I exchanged smiles, grateful, and I stuffed a curling shade between my glasses and my face, to protect my dilated pupils on the ride home. We rode the elevator down a floor and walked slowly out of the building, Zeke catching a ride in the stroller. Tears dripped down my cheeks, off my nose, into my mouth. I sighed and buried my face in his chest. He held me, feet from our car, surrounded by two-story office buildings and asphalt and abandoned vehicles. When I pulled back, I noticed a splotch of mascara on his shirt. “Sorry about that,” I said, smiling. “I’m used to it by now,” he said, smiling. In the parking lot of the doctor’s office, about to drive home after my first specialist appointment. We didn’t say much in the ten-minute ride home. When we pulled into our driveway, Kiley was under the carport at the far end of our driveway, hands on her hips and grinning as she watched my daughter holding her son’s hands as he took wobbling steps forward on our lawn. “How’d it go?” Kiley said, frowning when she saw my red face. “Well,” I said, looking at Jeremy. “Not great,” Jeremy said. We gave her a recap of what the doctor had said, had shown us, had not known about my condition. “And there’s literally nothing they can do to fix it?” she said. “But it’s not cancer?” she said. “But they said it wasn’t cancer,” said Jeremy. “Right,” I said, “But I just can’t imagine what else it could be.” Jeremy shrugged. “Yeah, me either,” I said. Jeremy nodded. She left a few minutes later, and while Jeremy played in the yard with the kids, I sat in a chair in the living room with the sun on my face and scribbled notes in my journal, a catchall for my racing mind, which sought to make sense of my circumstances in the way I always did – through writing. So I recorded the events and words spoken at the appointment; I thought of Joni Erickson-Tata teaching herself to paint with her mouth; I remembered my friend Beth’s son with the neurological issue, the one who committed suicide; I made a note to study blindness in the Bible (“Blind Bartimaeus,” I scribbled); I recorded which Psalms I had read that morning before walking through the doors of the doctor’s office (“Keep me safe, my God, for in you I take refuge,” from Psalm 16, and “Therefore let all the faithful pray to you while you may be found; surely the rising of the mighty waters will not reach them. You are my hiding place; you will protect me from trouble and surround me with songs of deliverance,” from Psalm 32). I wrote the words “cherishing my body – body positivity,” and mid-sentence, I heard my phone ding in my backpack, and I looked up. I reached into my bag and studied the phone: it was Jeremy. “You okay?” he texted from the yard. I put the phone away and walked to the bathroom, sat on the toilet, urinated, wiped, stood. As I went to flush, I did a double-take: my pee was neon yellow, just like the medical technician had said it would be. Finally, something predictable, I thought as I smiled and flushed it away. If you like it, share it – the only compensation I receive for this blog is reader support, which will hopefully give me the platform to publish a book soon. I’d appreciate your shares! He swung the mechanical arm and the metal mask toward me and rolled toward it on his stool to gaze in its eye holes. “Glasses off and rest your chin right there please,” he said, and I complied, hooking my glasses onto the edge of my collar. He flipped a few dials, then moved part of the mask to focus a handheld magnifier on my broken eye. He held it with his pointer finger and thumb, a small glass object, somewhere in the space between my eye and his, and he shone light straight into my pupil as he did so – all this to see with his own eyes into the depths of mine. He mumbled some medical terms I did not understand to his medical tech; she furiously tapped the keyboard; I tried not to blink or move as my eyes watered. Then he switched to the left, studied it, mumbled more medical jargon, which was memorialized digitally, and then he turned off the light and returned the mask and arm to its resting place to the left of the chair. “I want to show you these images of your eye that we captured, Elizabeth,” Dr. Patron said, standing and bending over the computer. His assistant rolled backward to give him space, and I shoved my glasses onto my face and frantically flipped to a blank page in my notebook, pen in my hand, so I didn’t miss anything. A few clicks and I was looking at what could be a black and white photograph of a sand dune. “This is your left retina,” he said, “You can see the layers in your retina and how you have a sort of plateau on each side, and right in the middle, there’s a dip. That’s normal.” He tapped the computer again and brought up another image of a sand dune – but this time, a hill rose in the center. “This is your right retina,” he said, pausing to let us take it in. I stared, disbelieving. “What does that mean?” Jeremy said. “It’s a lesion – and other than that, I’m not sure,” said Dr. Patron. “We can tell you a few things for sure: it’s not a tumor, so it’s not cancerous; it’s not infectious – at least not an active infection. And it’s not treatable,” he said. “What is it made of?” I said. “Well, it’s not fluid,” he said. “So, just skin? Protein?” I asked. I take a deep breath to take in the word: “Ratty.” My eye looks ratty. Perhaps the most important sensory organ in the body—and one out of two of mine looks ratty. If you are the owner of Literary Artifacts, or someone who enjoys this blog why not upgrade it to a Featured Listing or Permanent Listing?